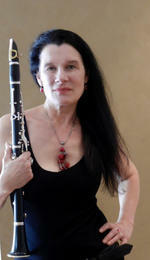 Brigid Burke was born on 11 February 1960 in Melbourne, Australia; she is a clarinet soloist, visual artist, composer, and educator. She commenced the piano at the age of 4, and, at 13, discovered the clarinet. She moved to Canberra in 1981 to study clarinet under Donald Westlake and Peter Clinch who had inspired her in her teens through their performances and recordings. She developed a passion for composition at this time (studied under Larry Sitsky and Dan Senn) and visual art. She continued to study both composition and performance - the former with Professor F. Gerard Errante at Norfolk Virginia USA and the latter with Warren Burt studying composition and multimedia techniques. She then undertook study with Dr Alistair Riddell and Dr Brenton Broadstock at the University of Melbourne, being awarded her Master of Music (Composition) degree in 1999. Early in her career, as a result of her study and numerous performances & involvement in New Music, Brigid Burke began integrating sound, visuals (video and slides) and theatre in her performances and compositions. She is interested in the cross-over points between different art worlds connecting all styles through different devices. Through performance, improvisation, visual, acoustic and electronic components she has established her own highly distinctive style, with unique approaches to music composition and creation. Burke has performed and composed extensively in solo and chamber recitals through acoustic and electronic media, both nationally and internationally. Recent festival highlights include the 2000 Sonic Residues Festival and the Festival of Contemporary Bralia in Romania. She also received favourable reviews for a recent solo concert in Adelaide which featured her original clarinet, live/prerecorded electronics and video compositions. Major projects have included an ABC commission for New Music Australia - the electroacoustic composition The retreating flower, the Composing Women's Festival (1994 & 97) and Melbourne International Festivals (1995-98). Composition awards include Buckland Room Foundation awards, grants from the South Australian Government and Australia Council Grants for performances of her works. As a freelance performer/composer Brigid Burke is recording regularly for ABC broadcasts on ABC FM as well as live broadcasts, CD recordings, and interviews on local & overseas radio. Her most recent CD recordings, INTERSECT and TRI DUO, have been reviewed and broadcast internationally. She is lecturing, performing and taking master classes at tertiary and secondary institutions throughout Australia and is currently Lecturer in clarinet and saxophone at Monash University. Muted harmony (sound sculpture) (1999) Commissioned by CMEC for Invisible Cities Festival. The arrow that flies (studio produced electronic music) (1998) Commissioned by Melbourne International Arts Festival, Grainger Museum. Sterling berneath : full orchestra (1998) Commissioned by State Orchestra of Victoria for workshop purposes. - Program note: Brigid Burke's "An Air on a Serpent for solo guitar"